From left to right: Gilson Finkelsztain, B3’s CEO; Patricia Lobaccaro, president and CEO of BrazilFoundation; Rodrigo Alonso, co-founder of Instituto ELOS; Flávia Alessandra, BrazilFoundation ambassador; Maria Cecilia Cruz, executive director for BrazilFoundation programs; Rosi Pedrosa, B3 Social Investment’s supervisor; Celso Grecco, BVSA’s consultant and founder; and Sonia Favaretto, B3’s managing director and superintendent of B3 Social Investment. 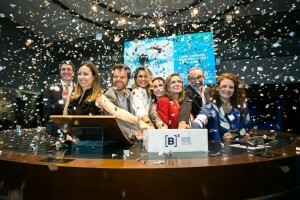 São Paulo, 22 de março 2018 – The Socio-Environmental Stock Exchange (BVSA) announced today at an event held at B3 the 20 social projects that will compose its portfolio in 2018. The initiative undertaken by B3 Social Investment also marked the closing of the 20 listed projects in 2017 with funding of over BRL1 million. The projects selected for 2018 are located in nine Brazilian states and the Federal District. The projects are themed on a wide range of topics – from biodiversity conservation to social inclusion and gender equality – and are in line with the Sustainable Development Goals (SDGs), reaffirming B3’s commitment to the United Nations. The selection of projects that integrate the BVSA is carried out annually by a committee composed of a B3 managing director, the Superintendent of B3 Social Investment and a representative of the United Nations Development Program (UNDP). Civil Society Organizations (CSOs) whose projects have been selected can raise funds up until March 2019 through the BVSA online platform at www.bvsa.com.br. “Since it was first created, BVSA has intermediated donations totaling over BRL18 million to 188 projects throughout Brazil,” recalled Gilson Finkelsztain, B3’s CEO at the launch ceremony of the 2018 BVSA portfolio. “And all this is done through a rigorous selection of projects, with complete accountability and transparency and full transfer of the funds raised to the organizations,” he added. Patricia Lobaccaro, President and CEO of BrazilFoundation, also attended the event and highlighted the three years partnership between BVSA and BrazilFoundation. Last year, the 20 listed projects raised BRL1.2 million through the partnership between BVSA and BrazilFoundation. On the BVSA web platform, fundraising reached 100% of the target for 7 projects and 50% for 13 projects, which will receive the initial funds and make a few adjustments for their completion. To become a “socio-environmental investor”, simply register on the www.bvsa.org.br webportal, choose the projects you wish to donate towards –according to the theme, target audience or region – and build your donation portfolio. Donations start from BRL20.00 and can be paid via credit card or bank transfer. Legal entities enjoy a tax benefit: the amounts donated are tax deductible as operating expenses up to 2% of the operating profit of the company (limited to legal entities taxed on actual profit). BVSA – Socio-Environmental Stock Exchange is a pioneering initiative created by B3 and is a fundraising platform with a format similar to a stock exchange. It is a safe, practical and transparent online donation environment. It aims to foster a culture of donations in Brazil, by connecting Brazilian organizations that need support for their socio-environmental projects and investors willing to help, thus contributing to a more just and equal society and also to environmental preservation. Managed by B3 Social Investment and having the Brazilian singer Daniela Mercury as its godmother, BVSA relies on the support of the United Nations Educational, Scientific and Cultural Organization (UNESCO) and the United Nations Development Programme (UNDP) and was recognized by the Global Compact as a study case and a model to be followed by other exchanges. Since it was created in 2003 BVSA has intermediated donations totaling over BRL18 million to 188 projects throughout Brazil. BVSA was replicated in South Africa, Portugal, Singapore, and in 2018 it will be replicated by the Jamaican Stock Exchange. BrazilFoundation is a not-for-profit organization that mobilizes resources for ideas and actions that transform Brazil. For this, the Foundation works with local leaders, NGOs and a global network of supporters to promote equality, social justice and economic opportunity for all Brazilians. Since 2000, BrazilFoundation has raised over US$40 million to support over 500 social organizations in 26 states across Brazil. BrazilFoundation is headquartered in New York and Rio de Janeiro with representative offices in São Paulo and Miami.